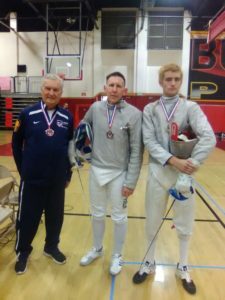 We had 53 fencers at our February tournament! We had fencers from Arizona, Nevada, San Diego and L.A.
A gym full of fencers! 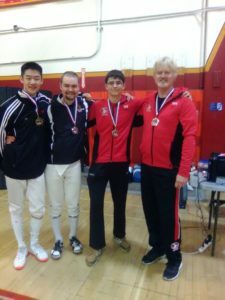 Epee (l-r): 1st, Eric Zhang (Team Touche), 2nd, James Fowler (Wildcat Fencing), 3rd, Jimmy Diederichs (Red Rock Fencing Center), 3rd, Frank van Dyke (Red Rock Fencing Center). Eric earned his A rating and Jimmy earned his B in epee! 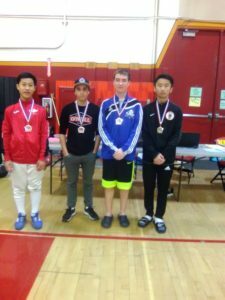 Foil (l-r): 3rd, Aiden Ryou (San Diego Fencing Center), 3rd, Matthew Moore (Gryphon), 2nd, Luke Goldade (South Coast Fencing Center), 1st Landon Lam (Orange County Fencing Center). Landon earned his E rating in foil! Saber (l-r): 3rd, Lucas Dobrzanski (Kern Athletic Fencing Foundation), 2nd, Dennis Stephen (DFA), 1st, Jade Abbott (HHS). This entry was posted on Sunday, February 10th, 2019 at 11:24 pm	and is filed under Uncategorized. You can follow any responses to this entry through the RSS 2.0 feed. Both comments and pings are currently closed.